Jesus told his disciples that if they followed Him, the world would hate them because they hated him first. And yet the first disciple to die after his death was not one of the original Twelve, but Saint Stephen, the first martyr of the Christian Church. Stephen was one of seven deacons appointed to distribute food and aid to members of the community. He was the eldest, and was called archdeacon. At the time, Christians were considered heretics to the Jewish faith, as Jesus himself was crucified for claiming to be God. Three years ago on this blog, I celebrated Doctor Who’s 50th anniversary by introducing my readers to each era. Then I created a blog that I recently revived called Jelly Babies and Reversed Polarities, where I review the show and audio dramas from Big Finish. But in looking back in the show, I’ve noticed that there may be a character in the show on the autism spectrum: Adric. Adric first appeared in the episode “Full Circle”, during Tom Baker’s era as the Fourth Doctor. In this episode, we learn that he is exceptionally intelligent because he receives a badge to commemorate his skills in mathematics. Two episodes make use of these skills: “Logopolis” and “Earthshock”. It’s also a plot point in one of Big Finish’s Destiny of the Doctor plays Smoke and Mirrors. Despite his intelligence, Adric is gullible. In quite a few stories, he is duped by the villain, such as “State of Decay” and “Four to Doomsday” (in “Four to Doomsday”, the Fifth Doctor gets especially cross with Adric for this reason) As someone who also has Asperger’s syndrome, I can attest that I am also pretty gullible. I have often been made a fool by people I thought were my friends, only to learn the truth to my embarrassment. Twenty-five years ago, Star Trek wasn’t just in theaters, it was on TV too. The Next Generation was a hit, and a spin-off called Deep Space 9 was also produced, the first to be done without any involvement from Gene Roddenberry. 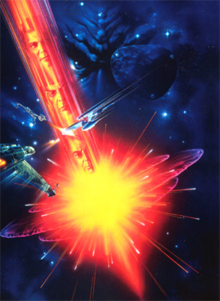 Star Trek V was by almost all accounts a terrible movie, but this was the anniversary. Something special had to be done. Paramount was poised to start a new series of movies, this time focusing on The Next Generation. To begin, the torch had to be passed, and we needed a proper movie to make it work. Once more onto the breach, to quote Shakespeare. In fact, Shakespeare is appropriate, as the subtitle is also a Shakespeare play reference. Did I mention there’s a scene where the Klingons quote Shakespeare as well? This movie brought everything full circle. As in Wrath of Khan, the crew is once again feeling their age. Sulu is now the captain of the Excelsior. Kirk is expected to give up his grudge against the Klingons, a grudge fueled by the death of his son in Search for Spock. Kirk has discovered that two Klingon dignitaries have been killed, and he is the prime suspect. With the murder of his son, Kirk has a proper motive. DC Comics ended the “New 52”: The New 52 was a mixed bag at best. Batman was good, but Superman was stripped of everything that made him what people love. Man fans were disappointed with the new direction, and DC eventually realized this. With their event “Rebirth”, they hit the reset button. Wally West came back to the DCU. Oh and Superman has a kid now? Suddenly comics are interesting again! Great New Music: As a music lover, this is always a good thing. Four of my favorite bands released great albums this year: Sting, Cheap Trick, Bon Jovi, The Red Hot Chili Peppers, and Soul Asylum (with the Chili Peppers’s newest album being the best of them). I enjoyed The Getaway much better than Me Without You. While Bon Jovi seemed incomplete without Richie Sambora, This House Is Not For Sale wasn’t bad. Sting’s album 57th and 9th seemed like a return to the music he recorded when he was still in The Police. And as I’m posting this, the Rolling Stones have released their first album in a decade, Blue Lonesome!